The Income Declaration Scheme, 2016 (the Scheme) provides an opportunity to persons who have not paid full taxes in the past to come forward and declare their undisclosed income and assets. The Scheme has come into effect from 1.6.2016 and is open for declarations up to 30.9.2016. 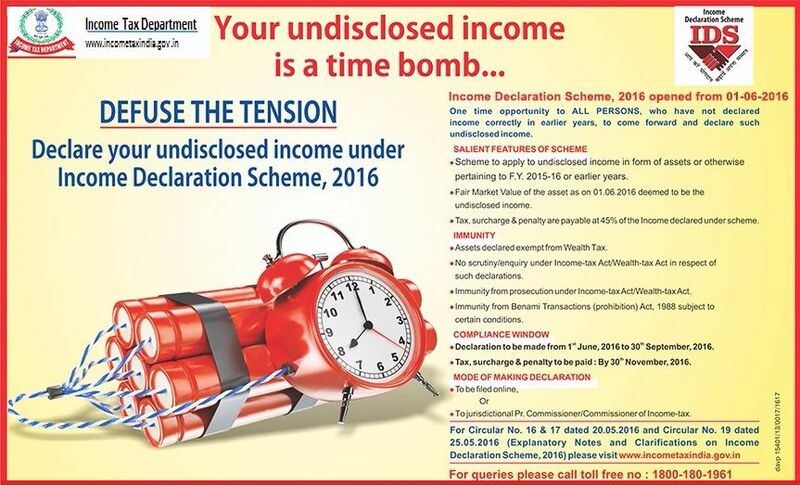 The Income Declaration Scheme, 2016 Rules (the Rules) have been notified on 19.5.2016. The amount payable under the Scheme can be paid in instalments viz. 25% of the total amount payable by 30.11.2016; another 25% by 31.3.2017 and balance 50% by 30.9.2017. 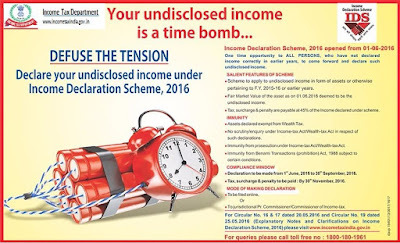 • The information in respect of a valid declaration is confidential and shall neither be shared with any law enforcement agency nor shall be enquired into by the Incometax Department. • The assets declared under the Scheme are to be valued at cost of acquisition or at fair market price as on 1.6.2016 as determined by the registered valuer, whichever is higher. However, an option for valuation of registered immovable property on the basis of stamp duty value of acquisition adjusted with the Cost Inflation Index has also been provided. • Credit for unclaimed TDS made on declared income shall be allowed. • The amount of fictitious liabilities recorded in audited balance sheet and not linked to acquisition of an asset can be disclosed under the Scheme as such. • The period of holding of declared registered immovable assets shall be taken on the basis of the actual date of registration. • The valuation report obtained by the declarant from a registered valuer shall not be questioned by the department. However, valuer’s accountability will remain. • No adverse action shall be taken by FIU or the income-tax department solely on the basis of the information regarding cash deposit made consequent to the declaration under the Scheme. • No enquiry/investigation shall be made in respect of the undisclosed income and assets declared under the Scheme even if the evidence of same is found subsequently during course of search or survey proceedings (circular No.32 dated 01.09.2016). Commissioner/Commissioner under the Incometax Act. 4. In view of the fact that all the major queries and concerns of stakeholders have already been addressed by issue of circulars (FAQs) and also to provide stability and certainty to the Scheme, it is envisaged that no further clarifications on the Scheme shall be issued. 5. It is reiterated that the Scheme closes on 30.09.2016. The extension of the scheme is out of question.